David Robert Jones (8 Januar 1947-10 Januar 2016), kent bi his stage name David Bowie (/ˈboʊ.i/), wis a Inglis muisicker, sangster-sangwriter, record producer, actor an arranger. Bowie haes been a major figur in the warld o popular muisic for ower fower decade, an is renouned as a new-fangler, parteecular for his wirk in the 1970s. He is kent for his distinctive vyce as weel as the intellectual dee^pth an eclecticism o his wirk. 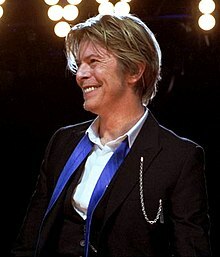 Wikimedia Commons haes media relatit tae David Bowie. This page wis last eeditit on 21 Apryle 2019, at 04:37.